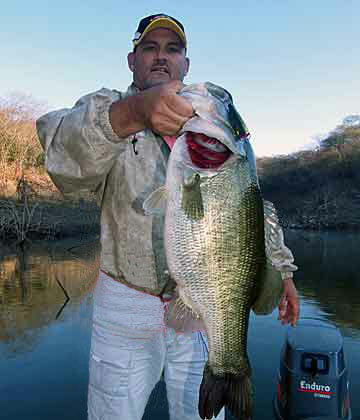 Big topwater bass of the week for out group!! Looks like 10-pounder for sure as Ron hoists the giant bass up for a photo after Gabrielle helps free it from a thorn tree snag. The huge pre-spawn female is full of eggs with the big Florida bass maw. We are all thinking 10 pounds plus, but the Boga grips don't lie (I'm told) and say the hog is 'only' another ocho ocho (8 pounds 8 ounces). Does Ron look like he's disappointed? Look at the belly on that thing!!! A head as big as the one on my day 1 hog bass, but Ron's fish is full of eggs while mine was spawned out. 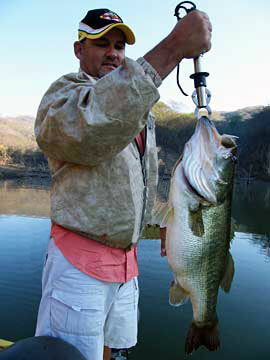 Can you imagine a topwater bass of that size? ?